Everyone needs a website today. We have a full range of capabilities and experience. We can select the plan and structure that is right for you AND your budget. We include the setup and upload to the server of your choice (we can help you find one). We also offer updates, SEO, and maintainence to keep your site fresh. Virtual Transcription PC Dictation! We transcribe, edit, format, deliver: Legal pleadings, briefs, manuscripts, real estate documents, and more. RAMtech Virtual PC Technical Support Online -we fix computers NOW, remotely. Certified Techs! Guaranteed Fix or you don't pay. To prove it, we fix your computer first, no upfront costs are requested, the honor pay system is relied upon. We only work with honest people and so should you. IMAGEhost is a small, full-service, web design shop in New Mexico. On this page are links to our latest website projects completed over the last few months. Contact us by email if you need a small company website. We work well within small budgets and can do most everything the "big guys" do! RGSGRAPHICS.COM is a graphic design company in the Los Angeles area. We used Macromedia Flash to create most of their website pages, but kept in mind search engine optimization ("SEO"). RGS has done great work for well-known packaging and distribution companies. Check out the colorful online portfolio. We have been involved with co-creating THE FOODMUSEUM.COM website since 1994. Recently, the owners became interested in learning how to use Dreamweaver in order to change and update this fantastic and complete online musueum collection of fun facts and educational images. IMAGEhost volunteered to teach them how to use Dreamweaver and Tom has done a great job! This website is perfect for everyone to enjoy and contains 100's of web pages, plus an Ecommerce store which we set up earlier this year in an effort to support their continued on-line presence. TRANQUILITYART.COM owner, Lynn Dickison, wanted a website with embedded, soft, "massage music". We also created a little javasript photo album for the "Artist Lynn" part of the website. Lynn specializes in "hot rock" massage using smooth river rock from around Taos, New Mexico. Her spa is in the North Valley in Albuquerque, New Mexico - be sure to visit her! DEDICATEDTOHEALTH.COM is dedicated to providing caring, personalized, alternative therapies using chiropractic, nutritional, massage, and advanced weight loss therapies. Dr. Stephanie King was very pleased with the website we created for her and promised to refer us to her patients and friends. 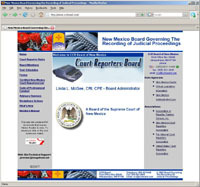 CCRBOARD.COM is the State of New Mexico's Board Governing the Recording of Judicial Proceedings. We created a functional, beautiful website using different elements such as flash. Forms and applications are PDF accessible. We created their logo graphics using 3 separate photo quality graphics and adopting their newsletter color scheme. We linked their "what's new" section to a typepad tool so that the administrator could easily add notes and updates "on the fly" without requiring technical knowledge. ASKJOYCELAINKENNEDY.COM uses the "telemarketing secrets" templates and methods taught by Alex Mandossian. Here we incorporated audio and FLASH in the website to grab attention and programmed in the code required by a shopping cart and email management system. Joyce Lain Kennedy is a well-known columnist and invites visitors to ask her a career-related question hosted by Darrell Gurney, the CareerGuy.